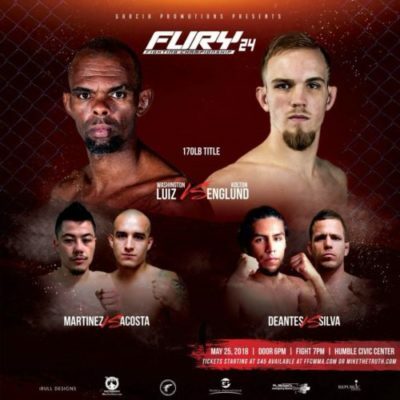 Fury Fighting Championship returns to the Humble Civic Center on May 25 for Fury FC 24. The event takes place on May 25, and will be headlined with a championship super fight. In the main event, the Fury FC Welterweight Champion, Washington Luiz, will put his title on the line against the Fury FC Lightweight Champion, Kolton Englund. Luiz captured the vacant title at Fury FC 23 with a TKO victory over Chris Lopez. This will be Englund first fight in over a year. He captured the lightweight strap at Fury FC 16 last year with a submission win over Rey Trujillo. The co-main event features Jacob Silva taking on Juan Deantes. Silva started his career 0-2, but is currently on a 3-fight winning streak, with all of his wins coming via 1st round stoppage. Deantes brings in an undefeated 4-0 record, with his last 3 fights ending by submission. Check out the rest of the card below. You can purchase your Fury FC 24 tickets here at MikeTheTruth.com. Select your favorite fighter so they will get credit. No there isn’t. But there may be a stream on the Fury Fighting Facebook page. Is there any option to purchase a stream of the fight?